Asian shares rose on Friday after U.S. Treasury Secretary Steven Mnuchin said the United States and China were “making a lot of progress” in talks and he looks forward to discussions with Chinese Vice Premier Liu He next week. Separately, U.S. Commerce Secretary Wilbur Ross told CNBC on Thursday that the U.S. is “miles and miles” from a trade deal with China but there is a fair chance they will get a deal. China’s Shanghai Composite Index rose 10.03 points or 0.4 percent to 2,601.72, while Hong Kong’s Hang Seng Index soared 448.21 points or 1.7 percent to 27,569.19. Japanese shares a hit five-week high as chip-related firms tracked their U.S. peers higher following well-received earnings out of the semiconductor sector. 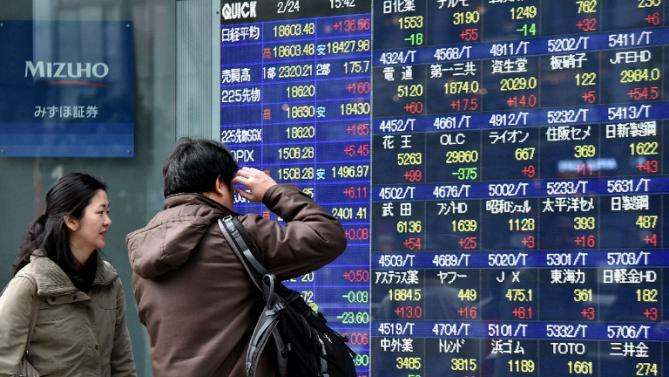 The Nikkei 225 Index jumped 198.93 points or 1 percent to 20,773.56, the highest closing level since December 19th. The broader Topix closed 0.9 percent higher at 1,566.10. Sumco Corp. jumped 11.6 percent, Tokyo Electron rallied 4.7 percent and Advantest added 4.9 percent on hopes for a recovery in the global chip sector. Apple suppliers Murata Manufacturing and Alps Alpine rose 5-6 percent. Nissan Motor gained 2.5 percent after Renault appointed Michelin boss Jean-Dominique Senard as its new chairman. On the economic front, a government report showed that overall consumer prices in the Tokyo region rose an annual 0.4 percent in January. That was unchanged from the December reading, although it exceeded expectations for an increase of 0.2 percent. Australian markets rose notably as higher commodities and oil prices helped lift mining and energy stocks. The benchmark S&P/ASX 200 Index climbed 39.90 points or 0.7 percent to 5,905.60, while the broader All Ordinaries Index ended up 40.60 points or 0.7 percent at 5,971.10. Mining heavyweights BHP and Rio Tinto rose over 1 percent after iron ore prices rallied overnight. Gold miner Evolution Mining advanced 1.1 percent and Newcrest surged up 1.7 percent. Oil Search, Woodside Petroleum, Santos and Beach Energy gained 1-2 percent as oil extended overnight gains. Banks ANZ, NAB and Westpac rose between 0.6 percent and 1 percent, while wealth manager AMP slumped nearly 8 percent after reporting a steep drop in its annual profit. Medical device maker Resmed plunged 12 percent after its top-line results for the second quarter missed analysts’ forecasts.